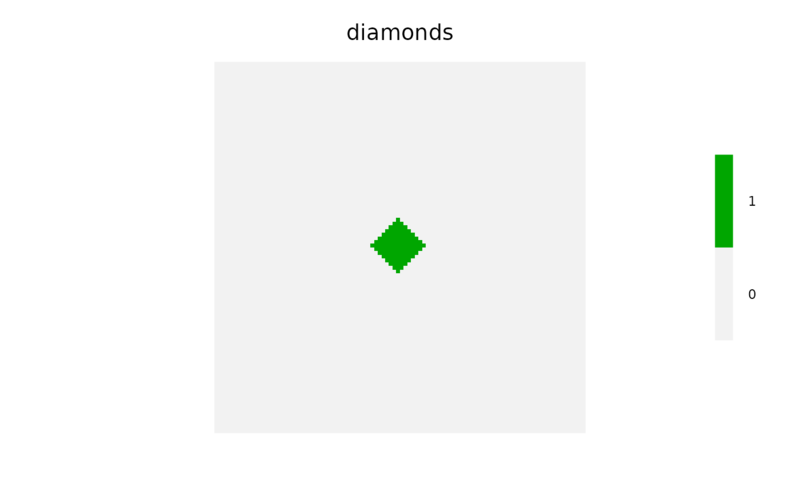 Simulate a spread process on a landscape. This can be used to simulate fires, seed dispersal, calculation of iterative, concentric landscape values (symmetric or asymmetric) and many other things. Essentially, it starts from a collection of cells (loci) and spreads to neighbours, according to the directions and spreadProb arguments. This can become quite general, if spreadProb is 1 as it will expand from every loci until all cells in the landscape have been covered. 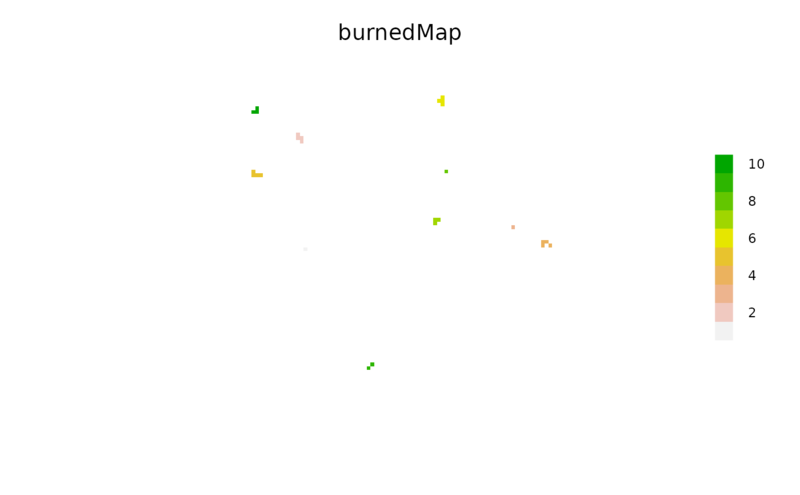 With id set to TRUE, the resulting map will be classified by the index of the cell where that event propagated from. 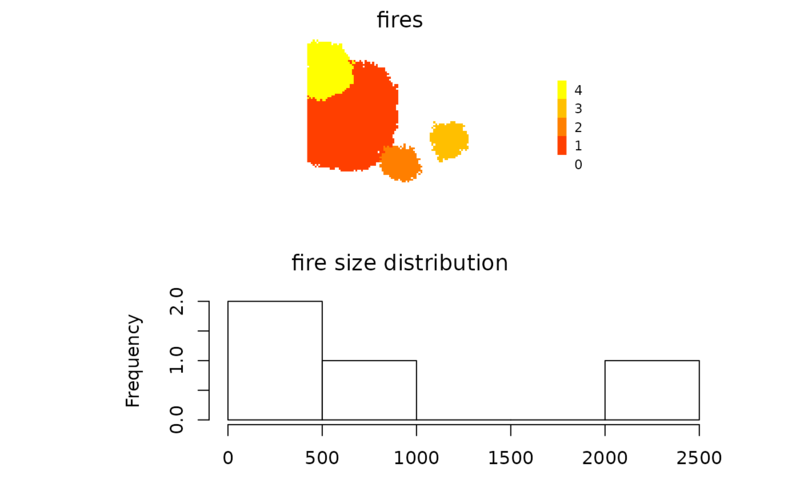 This can be used to examine things like fire size distributions. NOTE: See also spread2, which is more robust and can be used to build custom functions. However, under some conditions, this spread function is faster. The two functions can accomplish many of the same things, and key differences are internal. Numeric, or RasterLayer. If numeric of length 1, then this is the global probability of spreading into each cell from a neighbour. If a raster (or a vector of length ncell(landscape), resolution and extent of landscape), then this will be the cell-specific probability. Default is 0.23. If a spreadProbLater is provided, then this is only used for the first iteration. Also called "escape probability". See section on "Breaking out of spread events". A length 1 probability that an active cell will continue to burn, per time step. 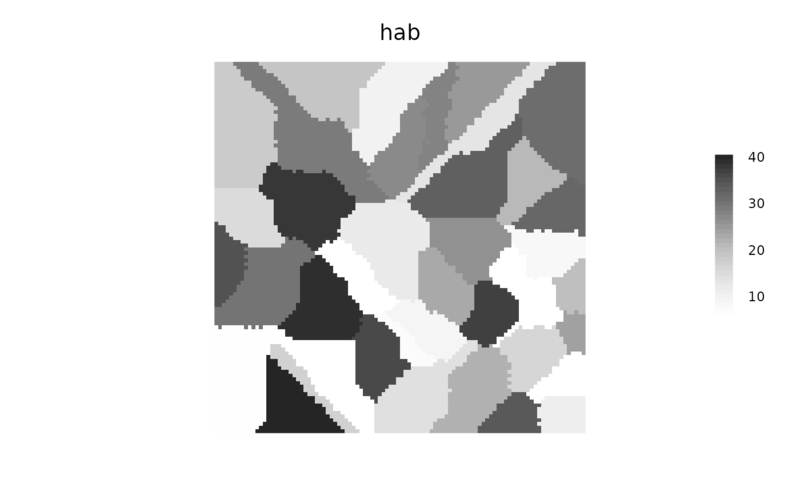 non-NULL, a RasterLayer object congruent with landscape whose elements are 0,1, where 1 indicates "cannot spread to". Currently not implemented, but identical behaviour can be achieved if spreadProb has zeros in all unspreadable locations. Numeric. Maximum number of cells for a single or all events to be spread. Recycled to match loci length, if it is not as long as loci. See section on Breaking out of spread events. The number of adjacent cells in which to look; default is 8 (Queen case). Can only be 4 or 8. Number of iterations to spread. Leaving this NULL allows the spread to continue until stops spreading itself (i.e., exhausts itself). Logical. If true, then function uses package ff internally. This is slower, but much lower memory footprint. If TRUE, then plot the raster at every iteration, so one can watch the spread event grow. Numeric, or RasterLayer. If provided, then this will become the spreadProb after the first iteration. See Details. data.table. This should be the output of a previous call to spread, where returnIndices was TRUE. Default NA, meaning the spread is starting from loci. See Details. Logical. If TRUE, then outward spread will be by equidistant rings, rather than solely by adjacent cells (via directions arg.). Default is FALSE. 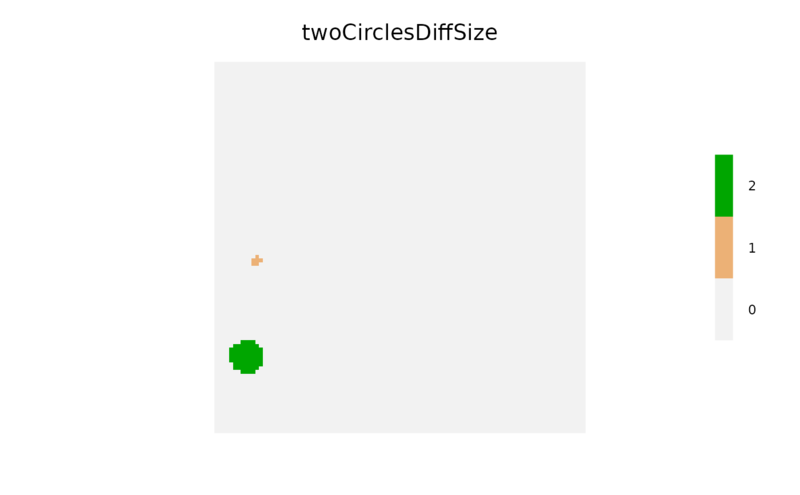 Using circle = TRUE can be dramatically slower for large problems. Note, this should usually be used with spreadProb = 1. Numeric. A further way to stop the outward spread of events. If circle is TRUE, then it will grow to this maximum radius. See section on Breaking out of spread events. Default is NA. A function which will be used to assess whether each individual cluster should stop growing. This function can be an argument of "landscape", "id", "cells", and any other named vectors, a named list of named vectors, or a named data.frame with column names passed to spread in the .... Default NA, meaning that spreading will not stop as a function of the landscape. See section on "Breaking out of spread events" and examples. Character. Can be one of "includePixel", "excludePixel", "includeRing", or "excludeRing". If stopRule contains a function, this argument is used determine what to do with the cell(s) that caused the rule to be TRUE. See details. Default is "includeRing" which means to accept the entire ring of cells that caused the rule to be TRUE. A numeric indicating the ratio of the asymmetry to be used. Default is NA, indicating no asymmetry. See details. This is still experimental. Use with caution. A numeric indicating the angle in degrees (0 is "up", as in North on a map), that describes which way the asymmetry is. Logical. If TRUE, then several potentially time consuming checking (such as inRange) will be skipped. This should only be used if there is no concern about checking to ensure that inputs are legal. A numeric vector, whose sum is 1. It indicates the probabilities an individual spread iteration spreading to 1:length(neighProbs) neighbours. Logical. If TRUE, then the maxSize will be treated as exact sizes, i.e., the spread events will continue until they are floor(maxSize). 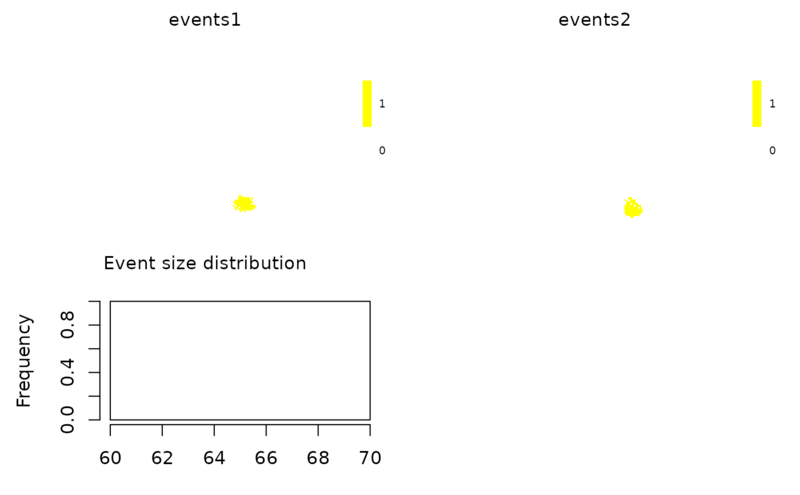 This is overridden by iterations, but if iterations is run, and individual events haven't reached maxSize, then the returned data.table will still have at least one active cell per event that did not achieve maxSize, so that the events can continue if passed into spread with spreadState. Logical. If TRUE, then spreadProb will be rescaled *within* the directions neighbours, such that the sum of the probabilities of all neighbours will be 1. Default FALSE, unless spreadProb values are not contained between 0 and 1, which will force relativeSpreadProb to be TRUE. Additional named vectors or named list of named vectors required for stopRule. These vectors should be as long as required e.g., length loci if there is one value per event. 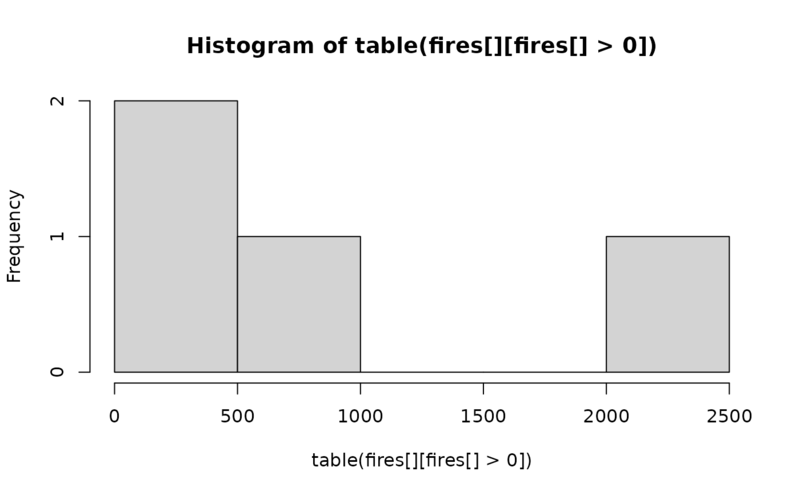 Either a RasterLayer indicating the spread of the process in the landscape or a data.table if returnIndices is TRUE. If a RasterLayer, then it represents every cell in which a successful spread event occurred. For the case of, say, a fire this would represent every cell that burned. If allowOverlap is TRUE, This RasterLayer will represent the sum of the individual event ids (which are numerics seq_along(loci). This will generally be of minimal use because it won't be possible to distinguish if event 2 overlapped with event 5 or if it was just event 7.
that have been spread into that have a common initial cell. the initial cell number of that particular spread event. 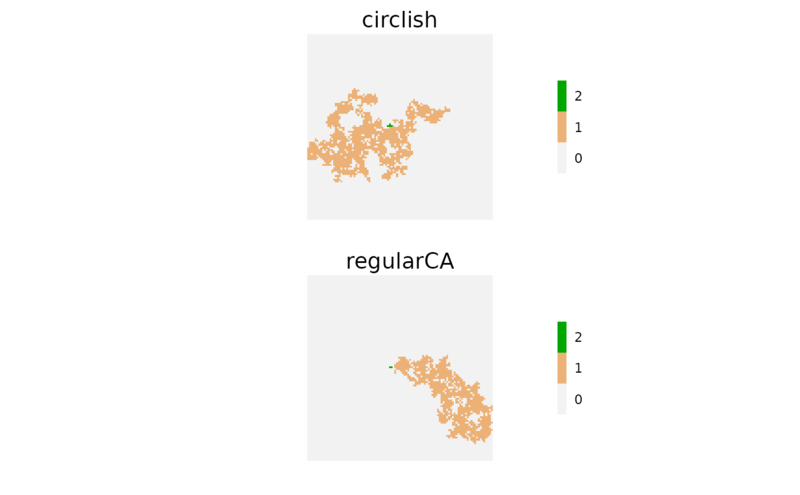 The cell indices of cells that have been touched by the spread algorithm. spreading will occur from these cells). This will generally be more useful when allowOverlap is TRUE. For large rasters, a combination of lowMemory = TRUE and returnIndices = TRUE will use the least amount of memory. 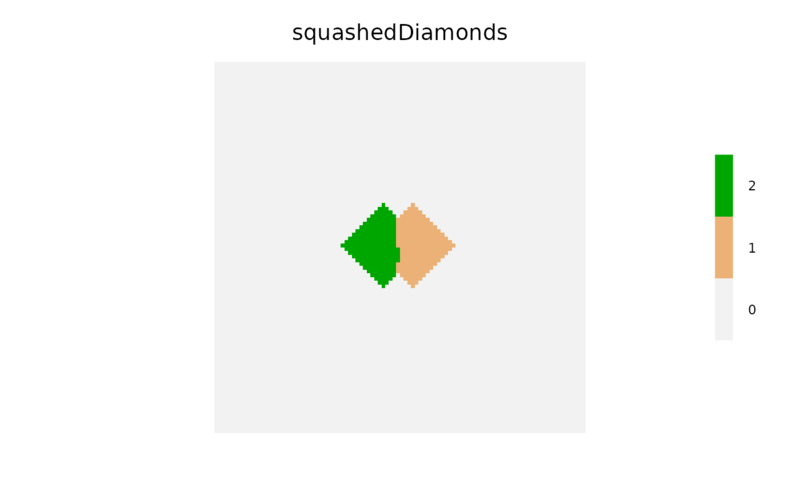 This function can be interrupted before all active cells are exhausted if the iterations value is reached before there are no more active cells to spread into. If this is desired, returnIndices should be TRUE and the output of this call can be passed subsequently as an input to this same function. 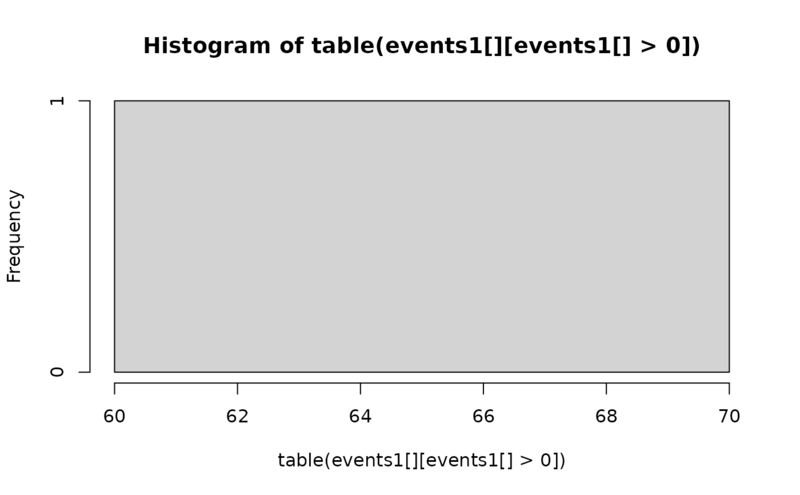 This is intended to be used for situations where external events happen during a spread event, or where one or more arguments to the spread function change before a spread event is completed. 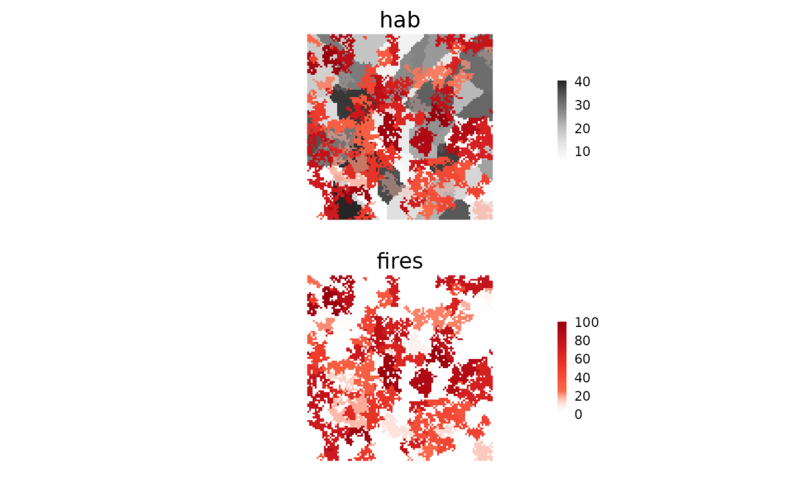 For example, if it is desired that the spreadProb change before a spread event is completed because, for example, a fire is spreading, and a new set of conditions arise due to a change in weather. 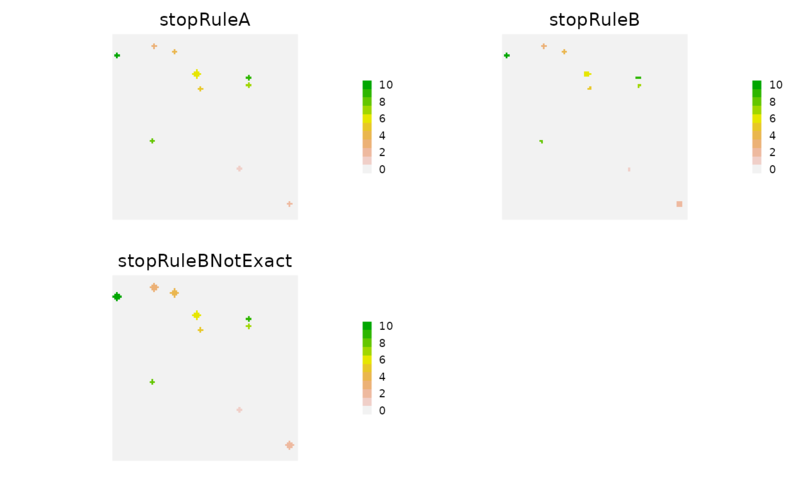 There are 4 ways for the spread to "stop" spreading. 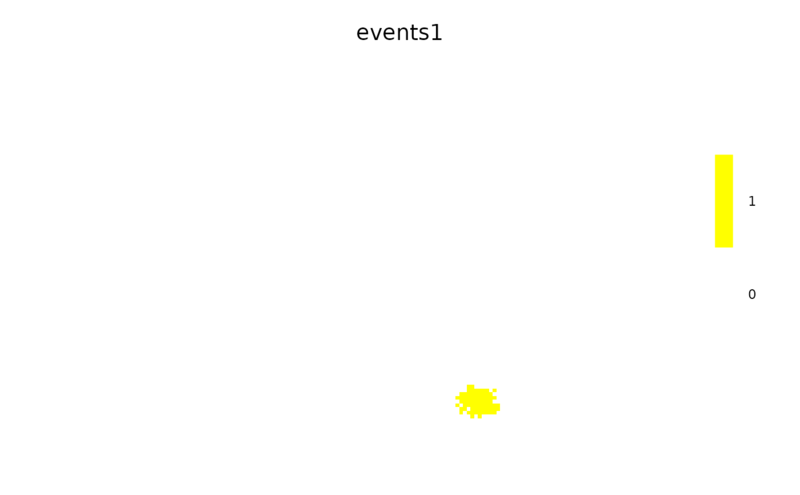 Here, each "event" is defined as all cells that are spawned from a single starting loci. So, one spread call can have multiple spreading "events". The ways outlines below are all acting at all times, i.e., they are not mutually exclusive. Therefore, it is the user's responsibility to make sure the different rules are interacting with each other correctly. Using spreadProb or maxSize are computationally fastest, sometimes dramatically so. 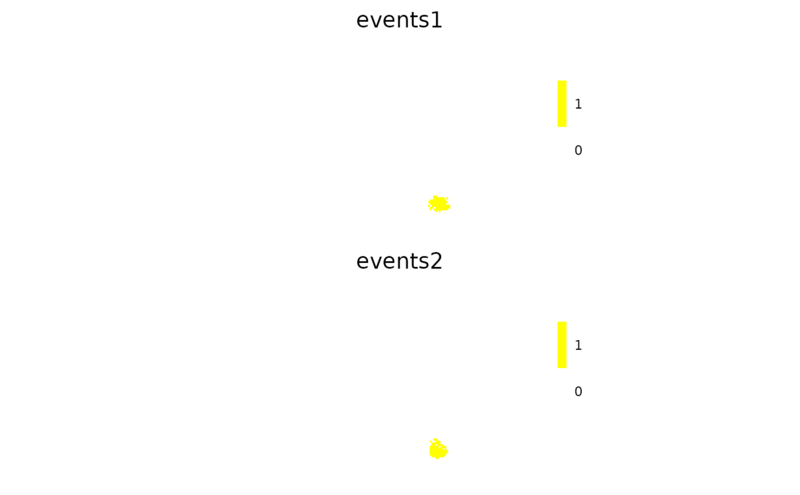 that are overlaid by the individual event. This can then be used in a logical statement. See examples. To confirm the cause of stopping, the user can assess the values after the function has finished. The spread function does not return the result of this stopRule. If, say, an event has both circleMaxRadius and stopRule, and it is the circleMaxRadius that caused the event spreading to stop, there will be no indicator returned from this function that indicates which rule caused the stop. stopRule has many use cases. One common use case is evaluating a neighbourhood around a focal set of points. This provides, therefore, an alternative to the buffer function or focal function. In both of those cases, the window/buffer size must be an input to the function. 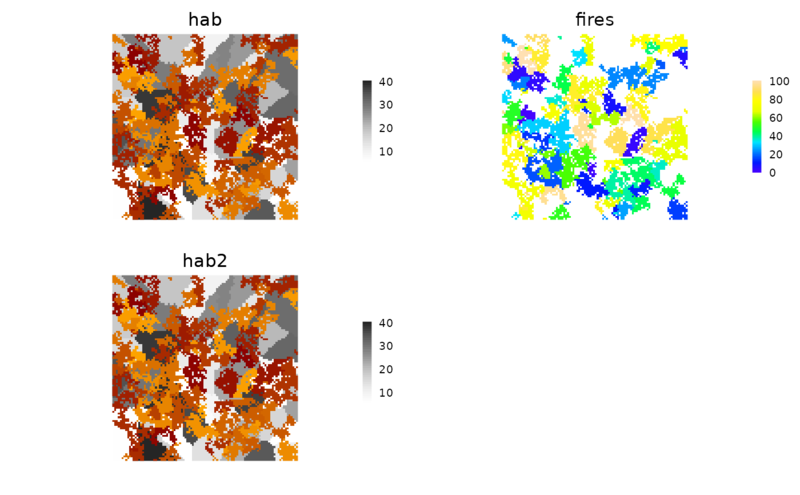 Here, the resulting size can be emergent based on the incremental growing and calculating of the landscape values underlying the spreading event. the last removed cell and include it in the return result for that event. spread2 for a different implementation of the same algorithm. It is more robust, meaning, there will be fewer unexplainable errors, and the behaviour has been better tested, so it is more likely to be exactly as described under all argument combinations. Also, rings which uses spread but with specific argument values selected for a specific purpose. distanceFromPoints. cir to create "circles"; it is fast for many small problems. 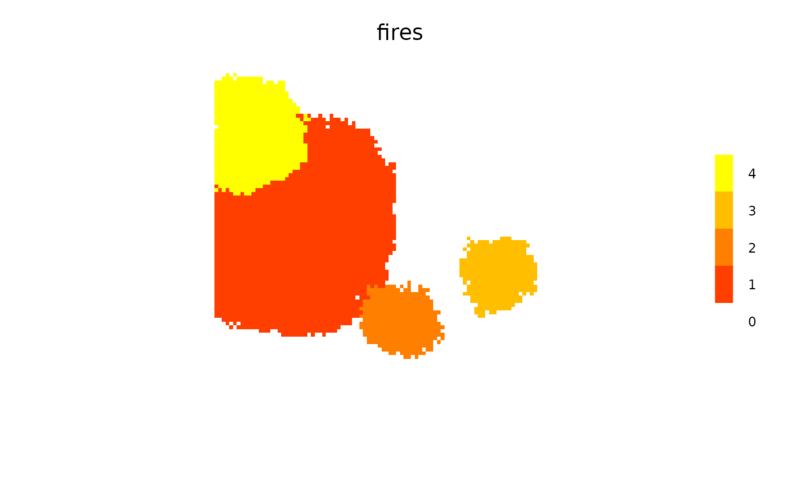 Plot(fires) # default colour range makes zero transparent. # using stopRuleBehavior = "excludePixel"
#  complete "iteration" of the spread algorithm is used. 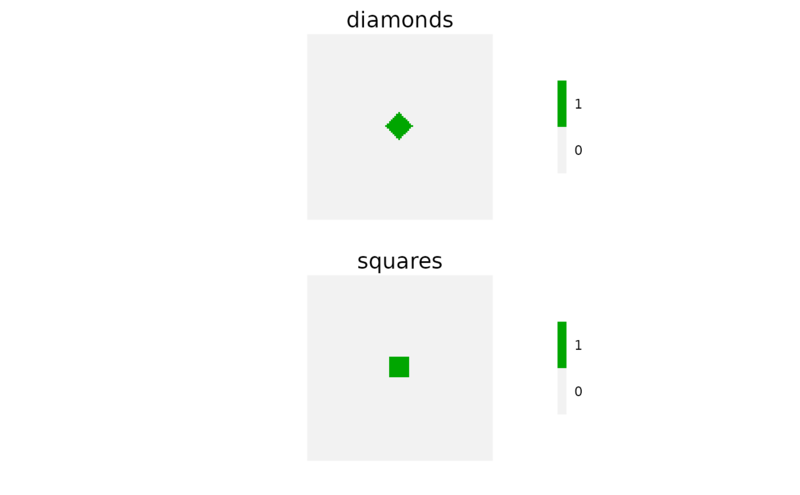 ##  (shown here because because spreadProb raster is not a probability). 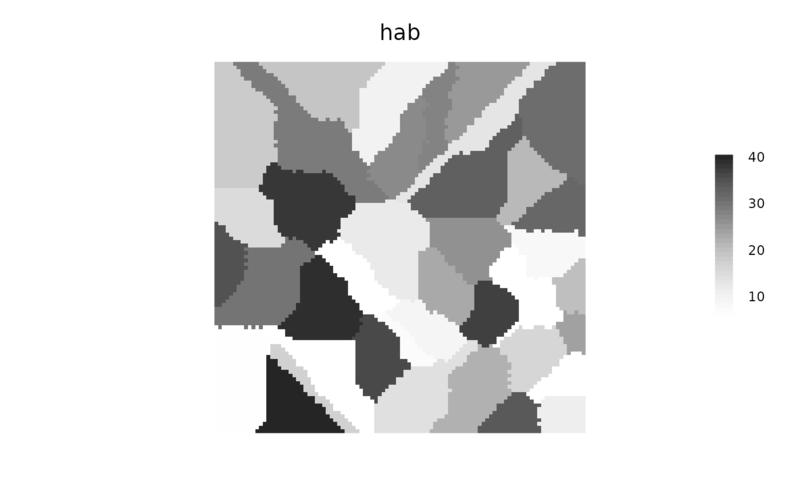 ##  according to the relative probabilities contained on hab layer.